Our team was asked to return to the EDI after missing out in 2016 to provide training and a campaign for the BSc Dental Hygiene/Therapy students. This was very worthwhile, the keen students took on-board the teaching from the morning workshops and delivered quality targeted interventions on mouth cancer to high-risk groups. Kindly arranged by the Minority Ethnic Health Inclusion Service (MEHIS), we split into 3 teams and visited NKS (a mixed South Asian community group), an Bangladeshi Men’s group at the Verandah Restaurant and a Chinese Women’s Group at the Xanadu Restaurant. The people engaged were thankful and asked us to return in the future so other members of their communities may benefit. After the day’s work Professor Victor Lopes gave our lecture “Let’s Talk About HPV” to the assembled audience of dental professionals from the EDI. This second year in Dundee had a different focus. No longer was there a large central base, instead the campaign was targeted to high-risk groups. In the main campaign week teams of final year BDS dental students & Dental Core Trainees participated in morning workshops to increase their confidence talking about mouth cancer and then designed their own targeted campaigns to reach specific high-risk groups. Spread over Dundee these volunteer teams engaged university students, patients attending Ninewells Hospital, ethnic minorities at the Dundee International Women’s Centre and the general public on the high street. In the evening Professor Victor Lopes delivered “Let’s Talk About HPV” a lecture highlighting the role of HPV in head and neck cancers to 65 local health professionals. Additionally for MCAW a group of final years, led by Louise Scott & Claire Connelly, on their own initiative took our campaign to Inverness during their Outreach placement. Furthermore there was a month long awareness drive based in the walk-in Dental A&E clinic. Throughout November 200 non-registered and irregular dental attenders were reached and completed a survey on mouth cancer, before being shown how to self-examine. Public reaction was excellent boosted by a visit from charity patron, Scott Hastings. Using the #mouthcheck, the Facebook reach was fantastic, in excess of 20,000! This was helped for good measure by on trend videos: “the mannequin challenge” received over 4900 views and a student led “boomerang video” had 1900 views. Our return to the Edinburgh Canal Festival saw a further 27 people complete the research survey and receive the Empowerment Journey intervention and learn mouth self-examination. Many more spoke to us and received information on Mouth Cancer. We’re grateful to Heather and Abdulla who enthusiastically joined us for the whole day. After being Edinburgh based it was time to spread out and we partnered with the annual Mouth Cancer Awareness Week (MCAW) run by Dundee Dental Hospital & School. This campaign was launched at a publicity event by our newly appointed patron, Scott Hastings. With a base in the Steeple Church Centre and satellite stall within the Overgate shopping centre, our team of volunteer BDS dental students and Dental Core Trainees directly reached 337 members of the public who took our Empowerment Journey learning our life saving message and mouth self-examination routine. The media interest was large and we featured in the local and national press including a report on the STV News at Six. For the first time we really pushed social media and our Facebook reach was over 7000. The successful CPD lecture “Empowerment in Mouth Cancer: Your Patient, from Diagnosis to Rehabilitation” was repeated here in joint session with the BDA Dundee and Perth District Section and well received by the 86 local health professionals in attendance. Now a registered charity LTAMC returned to a marquee in Bristo Square on 10-12th March 2015. Utilising more technology the layout was different, no “clinical” areas, instead 3 zones which mapped the patient’s empowerment journey to learn and discover more about mouth cancer prevention and detection through mouth self-examination. On entering the marquee knowledge of mouth cancer was assessed; then in the Info Zone there were models, leaflets and interactive iPad demonstrations of the risk factors, signs & symptoms and facts about mouth cancer; the final part of the journey was to be guided through an oral self-examination at the specially constructed Mirror Zone. Over 300 people took part in self-examination demonstrations and came in to find out more about mouth cancer. During the evenings a free CPD lecture “Empowerment in Mouth Cancer: Your Patient, from Diagnosis to Rehabilitation” was delivered to 114 dental and healthcare professionals. This session was delivered by 4 speakers who each had a different perspective of the mouth cancer treatment journey: Professor Victor Lopes (Consultant Oral & Maxillofacial Surgeon), Graeme (Mouth Cancer survivor), a Head & Neck Cancer Nurse, and Dr Ari Dutta (StR in Restorative dentistry). We were again grateful to the army of volunteers including BSc Dental Hygiene/Therapy students and dentists from the Edinburgh Dental Institute and Dundee Dental Hospital. Parliamentary approval was gained when Motion S4M-12632, which congratulated our awareness campaign, was lodged by Jim Eadie MSP and achieved cross party support in Holyrood. Taking advantage of the summer a 24 hour screening and awareness marquee was erected on the Meadows on the weekend 9/10th August during the Edinburgh Festival. This time 155 people received a free mouth cancer screening. Additionally Professor Victor Lopes delivered a series of 1 hour mouth cancer tutorials to local dentists in the sunshine. Simultaneously we had a 24 hour fundraising tandem bicycle riding around Edinburgh which drew the public in. Again a terrific team of volunteers from the Edinburgh Dental Institute made this 24 hour event possible. A smaller mouth cancer screening and awareness stall at the Edinburgh Canal Festival where 117 people were screened in an afternoon – all in the back of a gazebo! 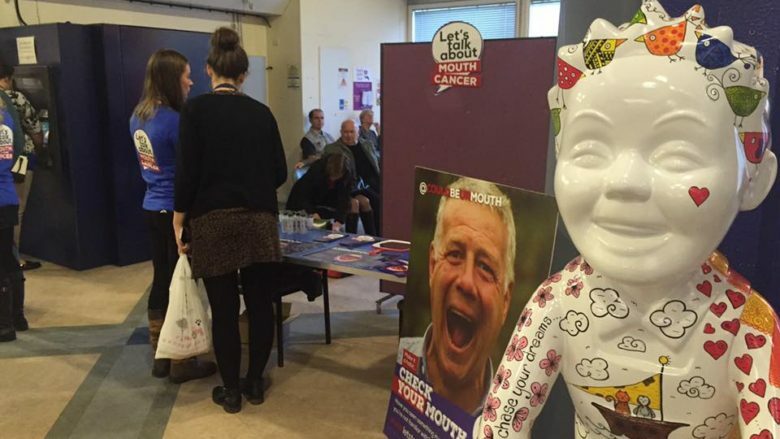 The first Let’s Talk About Mouth Cancer event held over 3 days on 11-13th February 2014. Our marquee was set up in Bristo Square at the heart of the University of Edinburgh campus. Our team of volunteers (BSc Dental Hygiene/Therapy students, Dental Nurses, Dental Core Trainees and dentists) engaged over 600 members of the public and in total 455 people received a free moth cancer screening – a rate of 1 person screened every 1 minute 20 seconds! In the evenings free CPD lectures emphasising the importance of prevention and early detection of mouth cancer were delivered to 105 local dental professionals by Professor Victor Lopes. We were supported by NHS Lothian, the Minority Ethnic Health Inclusion Service (MEHIS), the University of Edinburgh and the Department of Oral Surgery from the Edinburgh Dental Institute. The campaign was hugely successful and was featured on the STV 6pm News, BBC Radio Scotland and in articles in the Scotsman, Herald, Courier and BBC News Website.